Tag Archive | "Lehman Bankruptcy"
Wells Fargo’s Attorney– “We are the HOLDER of THE NOTE! Just how far that review would go is the subject of debate in the Senate. The Valukas report found clear evidence that the New York Fed knew that Lehman was sending it garbage that it had no intention to market. In other words, the baskets of assets were created for the specific purpose of selling to the Fed for far more than they were worth. Lehman knew it too: “No intention to market” was scrawled on one of the internal presentations about the assets. A separate bank, Citigroup, later characterized the assets as “bottom of the barrel” and “junk” when Lehman tried to push them their way, according to the report. Geithner himself was aware that there was a gap between what Lehman claimed the assets were worth and what they were really worth. “The challenge for the Government, and for troubled firms like Lehman, was to reduce risk exposure, and the act of reducing risk by selling assets could result in ‘collateral damage’ by demonstrating weakness and exposing air’ in the marks,” Geithner said, according to the report. The assets, called “Freedom CLOs”, were sold to the Fed’s “Primary Dealer Credit Facility,” according to the report. It was a get-out-of-debt scheme and could “serve as a ‘warehouse’ for short term securities [b]acked by corporate loans [and] “MAY BE THE ‘EXIT STRATEGY’ FUNDING SOURCE WE NEED TO GET NEW COMPETITION IN THE CORPORATE LOAN MARKET,” according to the Lehman analysis. Fuld has declared himself vindicated by the report. The Fed won’t say how much more toxic “garbage” is in the Fed’s “warehouse” and that also concerns Grayson. “The Fed’s balance sheet is a cartoon version of what’s actually inside,” said Grayson. Lehman did indeed create securitizations for the PDCF with a view toward treating the new facility as a “warehouse” for its illiquid leveraged loans. In March 2008, Lehman packaged 66 corporate loans to create the “Freedom CLO.” The transaction consisted of two tranches: a $2.26 billion senior note, priced at par, rated single A, and designed to be PDCF eligible, and an unrated $570 million equity tranche. The loans that Freedom “repackaged” included high?yield leveraged loans, which Lehman had difficulty moving off its books, and included unsecured loans to Countrywide Financial Corp. It is unclear, based solely on the e?mail, why a reference linking the FRBNY’s liquidity facility to the Freedom CLO was deleted. One explanation could be that Lehman did not want the public to learn that it had securitized illiquid loans exclusively to be pledged to the PDCF. Another reason may have been to hide the fact that Lehman needed to access the PDCF in the first place, given that accessing the securities dealers’ lender of last resort could have negative signaling implications. as an opportunity to move illiquid assets into a securitization that would be PDCF eligible. They [Lehman] also noted they intended to create 2 or 3 additional PDCF eligible securitizations. We avoided comment on the securitization but noted the firm’s intention to use the PDCF as an opportunity to finance assets they could not finance elsewhere. Thus, the FRBNY was aware that Lehman viewed the PDCF as an opportunity to finance its repackaged illiquid corporate loans. The Examiner’s investigation has not determined whether the FRBNY also understood that these Freedom-style securitizations were never intended for sale on the broader market. According to internal Lehman documents, Lehman did in fact pledge the Freedom CLO to the PDCF. 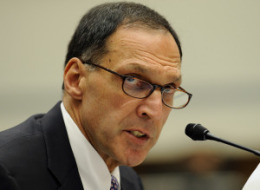 On three dates, March 24, 25 and 26, 2008, Lehman pledged the Freedom CLO to the FRBNY on an overnight basis, and received $2.13 billion for each transfer.5361 FRBNY discussions concerning the CLO’s underlying assets, however, took place on or around April 9, 20085362 — more than a week after the FRBNY began accepting the CLO. UPDATE: Tyler Durden at Zero Hedge has been all over this scandal. Get HuffPost Business On Twitter, Facebook, and Google Buzz! Know something we don’t? E-mail us at huffpostbiz@gmail.comsopping up junk loans that the investment bank couldn’t sell in the market, according to a report from court-appointed examiner Anton R. Valukas. Umm could we now say, we told you so?…Now on with Goldman and the rest of the dealers! The arcane “accounting gimmick” employed by Lehman Brothers as the firm failed in 2007 and 2008, was like “a drug” propelling the bank to conceal the true nature of its financial health, according to bankruptcy documents released yesterday. As news organizations pore through the 2,200 pages of documents released by Anton Valukas, the examiner in charge of sifting through the most expensive bankruptcy in history, new details have surfaced about possible criminal actions by Lehman executives. “I am very aware … it is another drug we [are] on,” Herbert McDade wrote in an April 2008 e-mail cited by the examiner’s report. At other times, he is described as calling for a limit to the number of Repo 105 transactions. [Repo 105 is] essentially a type of secured loan and is booked that way in the accounts — leading to an increase in both assets and liabilities. Lehman’s trick was to use a clause in the accounting rules to classify the deal as a sale, even though it was still obliged to repurchase the assets at a later date. That meant the assets disappeared from the balance sheet, and it could use the cash it received to temporarily pay down other liabilities…. [Repo 105] was crucial for maintaining the group’s credit rating as rating agencies and investors began to focus more on leverage and demanded lower risk. In May 2008, a Lehman Senior Vice President, Matthew Lee, wrote a letter to management alleging accounting improprieties;82 in the course of investigating the allegations, Ernst & Young was advised by Lee on June 12, 2008 that Lehman used $50 billion of Repo 105 transactions to temporarily move assets off balance sheet and quarter end. The question will be how far anybody can prove the responsibility extended. The report says “colorable claims” could be made against some Lehman execs and against Ernst & Young, the accountants. And by colorable claims, it means evidence that’s strong enough to potentially get a jury to award damages. UPDATE: On Friday’s Dylan Ratigan Show, the MSNBC host delved into the Lehman saga with former New York Governor Eliot Spitzer, breaking down the firm’s fraudulent meltdown in easily-understandable terms.